(Nanowerk News) The Swiss-Japanese partnership supports scientists in both countries when carrying out medical research. ETH researcher Takashi Ishikawa's project demonstrates the benefits of this. Researchers can now apply again with new projects. Takashi Ishikawa and his group examine cells that move using cilia, the so-called flagella. 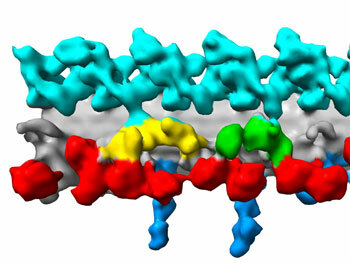 With the help of electron tomography, the ETH researchers can create a 3D structure image of the flagellum proteins. “This makes it possible to view and examine individual proteins in all their complexity for the first time,” says Takashi Ishikawa. Movement of the flagella is activated by so-called motor proteins. These are being studied by his colleague Yoko Toyoshima, professor at the University of Tokyo, together with her group. “While Switzerland has a long tradition of structural biology, research on motor proteins has been conducted in Japan for a long time. Our partnership allows us to complement and advance both areas of research,” Ishikawa emphasises. The Japanese-Swiss Cooperative Programme for Medical Research, brought to life by the State Secretariat for Education and Research (Staatssekretariat für Bildung und Forschung SBF) and the Japan Science and Technology Agency (JST), made this possible. The ETH Zurich coordinates the programme for Switzerland. Four to five research projects a year are financed with a total of 300,000 francs for the time period from 2008 to 2011. Switzerland and Japan each contribute half the funds. Each project selected is supported with 50,000 francs per year. Interested researchers can apply with their projects for a second cycle of three years until 16 November. Takashi Ishikawa’s project was selected from a pool of 30 applications. “We are at the beginning of our research, as we only started in April 2009,” says Ishikawa. The goal of the three-year partnership is to use three-dimensional structures to discover molecular mechanisms of flagella which may serve as activators for various diseases. One example is the cause of infertility. This can be due to a malfunction of the moving apparatus of the sperm. Tiny hairs also perform functions in the trachea through their movements. They clean the air before it reaches the lungs. If they do not work correctly, the risk of respiratory disorder increases. The motor protein dynein is responsible for moving the hairs. It transforms chemical energy into kinetic energy. Besides the medical applications, this basic research also aims to understand how exactly cells move with the help of flagella, how precisely the tail movement is directed, or how flagella are formed. These findings are also of interest for ETH researchers who are developing swimming nanobots. “These projects can also benefit from our experience with the bending mechanism of the flagella,” says ETH researcher Takashi Ishikawa. Besides the cooperative research, the programme includes reciprocal visits and a presentation of the results at international symposia. Flagella consist of a total of about 300 different proteins with various functions. In order to understand these biological processes, scientists study them in a model organism. The cells studied have a size of between 24 and 96 nanometres. One nanometre is approximately 70,000 times thinner than a human hair. The model organism is mutated in order to selectively affect individual proteins. This type of controlled mutation of motor proteins of the flagella is very complex. Colleagues from the University of Tokyo can assist here too: they can provide the necessary mutated model organisms for the ETH group.